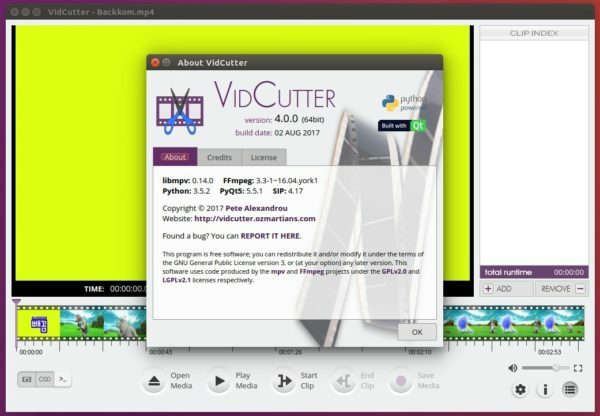 VidCutter, a simple and fast video cutter and joiner software, has reached the 4.0 release earlier today. big improvements on the old graphics hardware. loads of fixes and see more here. The developer’s PPA contains the latest packages for Ubuntu 16.04, Ubuntu 17.04, and their derivatives. There is something wrong in the command line explained here!! Crash on first run starting up. I am not sure what happen to the “Unexpected stop message” that appeared. Who receive it? No confirm message shown. Unfortunately I as an user cannot do anything with it – No support for cut&paste. Now the package does not even com to live. The install include the recommended “sudo apt install python-pip && pip3 install –upgrade PyOpenGL” It seems something to do with Python, although no issues were reported during installation. Pity, but unless I get some advice, an un-install seems the only way forward.